Early sources suggest that the great Renaissance painter Masaccio worked out the sophisticated perspective of the temple. The design is based, in part, on the plan for the dome of the cathedral of Santa Maria del Fiore in Florence. The haloes of Christ and the apostles contain an emblem with the Greek letters for Christ’s name, a symbol Bernardino of Siena promoted for religious devotion. He preached sermons in Florence in 1425 and 1426, and this lightweight canvas painting may relate to that visit. 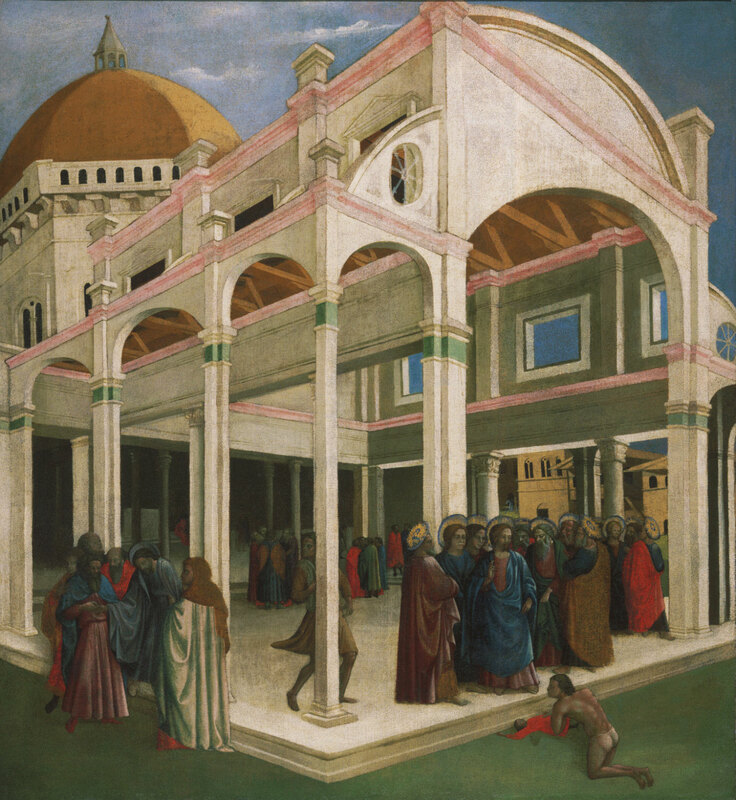 The scene takes place in an open building with a multifaceted dome meant to represent the temple in Jerusalem (see Giovanni di Paolo, Philadelphia Museum of Art, Johnson Collection cat. 105). To the left Judas, identified by a dark blue halo, accepts thirty pieces of silver from the elders to betray Christ (Matthew 26:14-15). 1 To the right Christ, surrounded by a group of apostles, performs a miracle by raising his hand toward two figures on the street outside, where a man clad only in underpants kneels over a child in red. As first noted by Roberto Longhi (1927, p. 65; 1940, p. 161), the combination of the scenes of Judas receiving blood money and Christ healing the lunatic occurs in a nearly contemporary silver plaque (see Paris, Musée du Louvre, Département des Objets d'art), often attributed to Filippo Brunelleschi, though recently it has been proposed that it was designed by Leon Battista Alberti, about 1439-42.4 There the two scenes are set in a city square in front of idealized antique and modern architecture. Clear correspondences between figures in the plaque and in Masaccio's paintings in the Brancacci chapel can also be found. In addition, as Paul Joannides (1993, p. 467) observed, the apostle seen from behind in the far right of the Johnson Collection's painting is the same-but reversed-as the apostle in the front right of the silver plaque. William Blundell Spence's identification of the Johnson painting as the work by Masaccio described by Vasari in 1550 as being in the house of Ridolfo del Ghirlandaio was supported by August Schmarsow (1895-99, 1928a), Wilhelm R. Valentiner (letter to Johnson, dated New York, May 16, 1911), Herbert Horne (letter to Johnson, dated Florence, June 9, 1911), and Frank Jewett Mather (letter to Johnson, dated Princeton, May 22, 1913; letter to Henri G. Marceau, dated Washington's Crossing, May 4, 1942; and his article of 1944). The auction catalogues of the Somzée (1904) and Sedelmeyer (1907) collections simply attributed the picture to Masaccio. Bernhard Berenson (1913, pp. 12, 14) was much more cautious, suggesting that it was an "imitation of or possibly a copy after a lost work." However, Berenson had trouble even with the idea that the picture was a copy, and wrote that "if it were a copy after Masaccio [it] would thus suggest questions regarding him not easy to answer. . . . Perhaps however, the problems here suggested have no real existence, for it is more than likely that Vasari was mistaken in ascribing to Masaccio the design which probably is the creation of his imitator Andrea di Giusto." In Berenson's lists (1932, 1936, 1963) the picture appeared as the work of Andrea di Giusto. Jacques Mesnil (1927), Mario Salmi (1932; 1948), Longhi (1940), Alessandro Parronchi (1966), and Luciano Berti (1964 and in Berti and Paolucci 1990) all concurred but recognized the possibility that Masaccio had had a hand in the design. Shell (1965) attributed the execution to Francesco d'Antonio and suggested that it was a copy from about 1430 after a lost original. He, however, felt that the design should be attributed to Masolino rather than Masaccio. Shell's attribution of the figures to Francesco d'Antonio was accepted by Beck (1977), who, however, believed that the painting was essentially designed by Masaccio, and Joannides (1993), who, like Shell, thought that Masolino was most likely responsible for its conception. The most telling comparison with Francesco d'Antonio's known work is perhaps with the figures in his predella to the Rinieri altarpiece of about 1426-30 (see Avignon, Musée du Petit Palais, no. M.I.475). Furthermore, although Francesco is recorded as being associated with Masolino on three occasions, this does not exclude the possibility that he worked with Masaccio on the Johnson painting. The perspective of the painting has been the object of much study. Parronchi (1959, fig. 3; 1964) demonstrated that the orthogonals receded to two vanishing points at the far ends of the horizon line, which he noted was the scheme Brunelleschi used to paint a perspectival rendering of the Palazzo Vecchio in Florence. The date of Brunelleschi's lost painting is much debated,5 but the most likely period is 1424-25, when he was involved in the construction of the cupola of the city's cathedral and made a painting of the baptistery from the main entrance of the cathedral. Shell (1965, p. 466 and fig. 3), while acknowledging the perspectival qualities of the Johnson picture, sought to demonstrate that Francesco d'Antonio's perspective was much more haphazard than Brunelleschi's and that the orthogonals did not merge on two precise vanishing points. However, careful examination of the principal orthogonals shows that they do converge on two vanishing points, although the artist did have trouble with some of the details, and the projection of the perspective can at best be called simplistic and imprecise (see Layout of the perspective of Philadelphia Museum of Art, Johnson Collection cat. 17 executed by Irma Passeri). For instance, orthogonals that do not run along a continuous straightedge (such as the capitals of the piers) do not in every case converge on the vanishing points. In addition, the rounded shapes and the arches were drawn with a compass as arcs of a circle and not in proper recession. The arches of the first and second bays of the left aisle are of equal size, with only the third bay adjusted in size to account for its recession in space. The piers and columns likewise fall in uneven spacing as they recede. Nevertheless, Francesco d'Antonio achieved a convincing sense of rational space by carefully hiding some of the inconsistencies with figure groups. For example, the pier before which Christ and the apostles stand has been pushed back and out of line with the others. The architecture of the Johnson canvas, while admittedly eclectic, is decidedly Brunelleschian. The cupola, the arched gallery surrounding its base, and the lantern resemble Brunelleschi's project for the cathedral of Santa Maria del Fiore in Florence, which was under construction at the time that this painting was executed, probably sometime between 1424 and 1429. Brunelleschi had first presented his plan in 1417. In 1418-19, together with Nanni di Banco and Donatello, he built a large brick model with painted and gilded wood detailing and displayed it outside the cathedral next to the bell tower. There were other models as well,6 and the project was officially approved in July 1420. While most of the models were destroyed, elements of some of them may survive in part in a model in the Museo dell'Opera del Duomo (see Florence, Museo dell'Opera del Duomo). An earlier model of the whole church, including the then-proposed cupola, made in 1367 by Giovanni di Lapo Ghini according to the specifications of a special artists' committee, was kept in the nave of the cathedral. This model was reflected in a mural of 1367-68 by Andrea di Bonaiuto in the Spanish chapel in the convent of Santa Maria Novella in Florence.7 Likewise, the Johnson painting seems to present Brunelleschi's plan as it would have appeared in the brick and wood model of 1418-19 and during the cupola's initial phase of construction. Other details of the architecture reflect Brunelleschian ideas. The window on the far left of the tribune resembles the typically Gothic windows of the fourteenth-century cathedral, but with the addition of a Renaissance frame with a triangular pediment. The horizontal windows in the clerestory have similar frames, perhaps suggesting that Brunelleschi planned to update the style of the cathedral's existing construction. The modernity of the painting's architecture is most apparent in the two-storied central nave, defined by columns supporting an architrave. In the upper story squared pilasters continue the vertical thrust of the columns. In general, the structure reflects a knowledge-undoubtedly derived from Brunelleschi-of Roman early Christian basilican architecture, and particularly, as August Schmarsow (1928a, p. 121) noted, Old Saint Peter's and Saint John Lateran. Berti (1964, p. 144 n. 228) noted that the halos of Christ and the apostles are incised with the insignia of Saint Bernardino of Siena, which contains the symbol of the Name of Jesus he invented as a new devotion and frequently used in his sermons. Bernardino preached in Florence in Santa Croce between March 8 and May 3, 1424, and again between February 4 and April 18, 1425; he later returned for a brief period in late July and early August 1427.23 Furthermore, in the 1480s Vespasiano da Bisticci (Greco ed. 1970-76, vol. 1, p. 250) notes that the saint also preached some very popular sermons in the cathedral, after which he visited the house of the humanist Giannozzo Manetti. Exactly when Bernardino preached in the cathedral is unknown, but it could have occurred during his short visit of 1427 or even during one of his visits to Santa Croce. Whether the choice of the subject of Christ healing the lunatic relates to Bernardino's extraordinary experience in Prato cannot be determined, but certainly the presence of his insignia on the halos suggests that the painting was at least produced around the time of one of his Florentine sojourns. The use of the lightweight canvas might mean that it was carried in procession during the ceremonies surrounding one of his sermons, which were extremely popular and emotional events. In Florence on one occasion his preaching in Santa Croce was interrupted by a crowd who wanted him to come out of the church to light a bonfire of vanities.27 He was invited back to preach in 1426, most probably by Leonardo Bruni, chancellor of the Republic of Florence.28 He did not return, however, until 1427. In Rome during the spring of 142729 Bernardino was investigated for the orthodoxy of his cult of the Name of Jesus but was eventually exonerated. Many of the initial attacks concerning his cult had been made in Florence in 1424 by his bitter enemy, the Dominican Manfredo da Vercelli. Two letters written by the humanist Ambrogio Traversari, a monk at the Florentine convent of Santa Maria degli Angeli, show how closely Bernardino's trial was followed and with what joy his exoneration was greeted in the city. 30 The presence of the symbol on the halos in this picture thus might have been a response to attacks on the Name of Jesus, just as the architecture may have been an answer to the doubts about Brunelleschi's program for the cathedral's cupola. The detail of the Johnson painting and especially its careful study of buildings and perspective would suggest that its use as a processional banner was rather limited, for its images would not have been readable at much distance. The artist may have used canvas instead of panel because he viewed the painting as an experiment in working out problems of representing buildings in perspective. However, the careful choice of the biblical text, especially as it might relate to criticism concerning Brunelleschi's cupola, and the presence of Bernardino's insignia on the halos would indicate that the painting was in fact prepared for or in response to a specific event. Carl Brandon Strehlke, from Italian paintings, 1250-1450, in the John G. Johnson Collection and the Philadelphia Museum of Art, 2004, pp. 134-143. 1. Judas has a similar halo in Lorenzo Monaco's Man of Sorrows of 1404; Florence, Galleria dell'Accademia, no. 467; Marvin Eisenberg. Lorenzo Monaco. Princeton, 1989, fig. 18, color plate details 1-2; Giorgio Bonsanti. La Galleria dell'Accademia, Firenze: guida e catalogo completo. Florence, 1987, color repros. pp. 78, 82. 2. Umberto Baldini and Ornella Casazza. La cappella Brancacci. Milan, 1990, postrestoration color repro. p. 38. 3. Umberto Baldini and Ornella Casazza. La cappella Brancacci. Milan, 1990, postrestoration color repro. p. 100. 4. Massimo Bulgarelli in Luciano Bellosi with Laura Cavazzini and Aldo Galli. Masaccio e le origini del rinascimento. Milan, 2002. Exhibition, San Giovanni Valdarno, September 20-December 21, 2002, pp. 218-21. 5. See Alessandro Parronchi. "Le due tavole prospettiche del Brunelleschi, I." Paragone-arte (Florence), vol. 9, no. 107 (November 1958), pp. 15-18; Alessandro Parronchi. Studi su la dolce prospettiva. Milan, 1964, pp. 245-49. Parronchi based his dating on the 1425 return to Florence of Paolo dal Pozzo Toscanelli, a mathematician friend of Brunelleschi's who had previously taught in Padua. 6. The painter Giuliano d'Arrigo Pesello, who was on the advisory committee for the cupola, also produced wooden models in 1420 (Cesare Guasti. La cupola di Santa Maria del Fiore, illustrata con i documenti di Archivio dell'Opera Secolare. Florence, 1857, p. 25, document 42) and 1425 (Cesare Guasti. La cupola di Santa Maria del Fiore, illustrata con i documenti di Archivio dell'Opera Secolare. Florence, 1857, p. 33, document 60). In his written report on the project, Giovanni di Gherardo Gherardi refers to another wooden model made by Brunelleschi in c. 1419 (see n. 21 below). Brunelleschi and Ghiberti were commissioned to prepare yet another in September 1429 (Cesare Guasti. La cupola di Santa Maria del Fiore, illustrata con i documenti di Archivio dell'Opera Secolare. Florence, 1857, pp. 33-34, documents 61-67). Probably other models were also made, as the building committees found them the best way to evaluate the project. 7. Richard Offner and Klara Steinweg. A Critical and Historical Corpus of Florentine Painting. Sec. 4, vol. 6, The Fourteenth Century: Andrea Bonaiuti. New York, 1979, plate ii. 8. "Fariassi un andito di fuori, sopra li occhi di sotto imbecchatellato con parapeti trasforati e d'altezza di braccia 2 o circa, al'avvenante delle trebunete di sotto; o veramente due anditi, l'uno sopra l'altro, in su una cornice ben ornata; e l'andito di sopra sia scoperto" (Let an outer ambulatory be constructed over the round windows below made up of open parapets of about two braccia in height, like the tribunes below. Actually [there should be] two ambulatories, one above the other, within a finely decorated cornice. The upper ambulatory should be open). Adapted from Howard Saalman. Filippo Brunelleschi: The Cupola of Santa Maria del Fiore. Studies in Architecture, 20. London, 1980, p. 73; on the date and meaning of this document, see Howard Saalman. Filippo Brunelleschi: The Cupola of Santa Maria del Fiore. Studies in Architecture, 20. London, 1980, pp. 77-97. 9. The only section of the ballatoio that was executed was the part that was built by Baccio d'Agnolo on the southeast side of the cathedral in 1514-15. It was never finished, seemingly because Michelangelo, who compared it to a grasshopper cage, said that it subverted Brunelleschi's design (Giorgio Vasari. Le vite de' più eccellenti pittori, scultori e architettori nelle redazioni del 1550 e 1568. Text edited by Rosanna Bettarini. Commentary edited by Paola Barocchi. vol 3 [text]. Florence, 1976, pp. 612-13). Alessandro Nova in Henry A. Millon and Vittorio Magnago Lampugnani. The Renaissance from Brunelleschi to Michelangelo. The Representation of Architecture. Milan, 1994. Exhibition, Venice, Palazzo Grassi, March 27-November 6, 1994, pp. 593-97. 10. Cesare Guasti, ed. Santa Maria del Fiore: la costruzione della chiesa e del campanile secondo i documenti tratti dall'Archivio dell'Opera Secolare e da quello di Stato. Florence, 1887, p. 158, document 119; Frank D. Prager and Gustina Scaglia. Brunelleschi: Studies of His Technology and Inventions. Cambridge, Mass., 1970, p. 7. 11. Cesare Guasti, ed. Santa Maria del Fiore: la costruzione della chiesa e del campanile secondo i documenti tratti dall'Archivio dell'Opera Secolare e da quello di Stato. Florence, 1887, pp. 308, 313, documents 454, 466-67; Frank D. Prager and Gustina Scaglia. Brunelleschi: Studies of His Technology and Inventions. Cambridge, Mass., 1970, p. 19. 12. Antonio di Tuccio Manetti, the architect's biographer, noted that the excessive width of the stone fittings around these windows seems to have disturbed Brunelleschi, in particular with regard to his plan for the ballatoio (Antonio di Tuccio Manetti. Vita di Filippo Brunelleschi preceduta da La Novella del Grasso. Edited by Domenico De Robertis. Introduction and critical notes by Giuliano Tanturli. Testi e documenti, 2. Milan, 1976, p. 115). The surviving wood model (see Florence, Museo dell'Opera del Duomo) of uncertain date has the occhi, but they are shown without their molding. The only explanations are either that that part of the model dates before 1413, or that, if Brunelleschi designed this model, he hoped a different solution would be eventually reached. 13. Howard Saalman. Filippo Brunelleschi: The Buildings. Studies in Architecture, 27. University Park, Pa., 1993, fig. 38. 14. Richard Krautheimer in collaboration with Trude Krautheimer-Hess. Lorenzo Ghiberti. Princeton Monographs in Art and Archaeology, 31. 3rd ed. Princeton, 1982, plate 30. 15. Richard Krautheimer in collaboration with Trude Krautheimer-Hess. Lorenzo Ghiberti. Princeton Monographs in Art and Archaeology, 31. 3rd ed. Princeton, 1982, plate 47. 16. Richard Krautheimer in collaboration with Trude Krautheimer-Hess. Lorenzo Ghiberti. Princeton Monographs in Art and Archaeology, 31. 3rd ed. Princeton, 1982, plate 42. 17. As noted by Christine Smith (in Henry A. Millon and Vittorio Magnago Lampugnani. The Renaissance from Brunelleschi to Michelangelo. The Representation of Architecture. Milan, 1994. Exhibition, Venice, Palazzo Grassi, March 27-November 6, 1994, p. 460), Filarete, writing in 1464, recorded that various artists painted views of buildings and places for Piero di Cosimo de' Medici, and Vasari, writing in the mid-1500s, mentioned a view of Venice with San Marco painted by Leon Battista Alberti. The Medici may have also owned Brunelleschi's views of the baptistery and the Palazzo Vecchio, or at least copies of them, as several versions of these subjects are recorded in the copy of the 1492 inventory of Lorenzo de' Medici's effects. See Marco Spallanzani and Giovanna Gaeta Bertelà, eds. Libro d'inventario dei beni di Lorenzo il Magnifico. Florence, 1992, pp. 21-22. 18. Andrew Ladis. Taddeo Gaddi: Critical Reappraisal and Catalogue Raisonné. Columbia, Mo., 1982, plate 4a-9. In the Florentine Filippo Villani's De origine civitatis Florentiae et eiusdem famosis civibus of 1381-82, Taddeo is described as being particularly talented in his representation of architecture. His fame with this regard did not die out in the following decades. A drawing after the mural exists (Andrew Ladis. Taddeo Gaddi: Critical Reappraisal and Catalogue Raisonné. Columbia, Mo., 1982, fig. 60), and, when they were in Italy in the early 1440s, the Limbourg brothers also made a copy of it, which they reemployed in an illumination of the Très Riches Heures (Chantilly, Musée Condé, Ms. 65; Millard Meiss with Sharon Off Dunlap Smith and Elizabeth Home Beatson. French Painting in the Time of Jean de Berry: The Limbourgs and Their Contemporaries. 2 vols. London, 1974, fig. 13). 19. Giorgio Vasari. Le vite de' più eccellenti pittori, scultori e architettori nelle redazioni del 1550 e 1568. Text edited by Rosanna Bettarini. Commentary edited by Paola Barocchi. vol. 2. Florence, 1967, p. 134. 20. The frame has enameled medallions of the four doctors of the church that recall the founding of San Lorenzo by Saint Ambrose in 593. The two cupolas on the sides of the main, templelike building in the center derive from Brunelleschi's design for the cupola of the Old Sacristry of San Lorenzo. The building on the left recalls an ancient model: the tombs of the Republican baker M. Virgilius Eurysaces, outside the Porta Maggiore in Rome, which are in the unusual form of a furnace. This may refer to the fact that the area of San Lorenzo was historically one of the principal places in Florence for public furnaces (Piero Bargellini and Ennio Guarnieri. Le strade di Firenze. vol. 4. Florence, 1978, pp. 144-45). For other elements on the architecture and the figures, see Massimo Bulgarelli in Luciano Bellosi with Laura Cavazzini and Aldo Galli. Masaccio e le origini del rinascimento. Milan, 2002. Exhibition, San Giovanni Valdarno, September 20-December 21, 2002, pp. 218-21. 21. Gherardi's criticisms are contained in a written and illustrated report. Florence, Archivio di Stato, inv. Mostra 158; Henry A. Millon and Vittorio Magnago Lampugnani. The Renaissance from Brunelleschi to Michelangelo. The Representation of Architecture. Milan, 1994. Exhibition, Venice, Palazzo Grassi, March 27-November 6, 1994, repro. p. 22. On him, see Howard Saalman. "Giovanni di Gherardo da Prato's Designs Concerning the Cupola of Santa Maria del Fiore in Florence." Journal of the Society of Architectural Historians (Amherst, Mass. ), vol. 18, no. 1 (March 1959), pp. 11-20. 22. Frank D. Prager and Gustina Scaglia. Brunelleschi: Studies of His Technology and Inventions. Cambridge, Mass., 1970, pp. 143-44, nos. v-vi. 23. Felice Alessio. Storia di San Bernardino da Siena e del suo tempo. Mondovì, 1899, p. 273; A. G. Ferrers Howell. S. Bernardino of Siena. Essay by Julia Cartwright. London, 1913, p. 167. 24. Dionisio Pacetti. "La predicazione di S. Bernardino in Toscana con documenti inediti estratti dagli atti del processo di canonizzazione." Archivum franciscanum historicum (Florence), vol. 33, nos. 3-4 (July-October 1940), p. 296. The account is in a letter from one Sandro Marcoualdi to his brother in Dubrovnik, received July 4, 1424. 25. Dionisio Pacetti. "La predicazione di S. Bernardino in Toscana con documenti inediti estratti dagli atti del processo di canonizzazione." Archivum franciscanum historicum (Florence), vol. 33, nos. 3-4 (July-October 1940), pp. 296-97 n. 3. 26. In 1451 Giovanni da Modena included the two episodes on a canvas altarpiece showing Saint Bernardino and his miracles for a chapel dedicated to the saint in San Francesco in Bologna (now Pinacoteca Nazionale; Carla Bernardini et al., eds. La Pinacoteca Nazionale di Bologna: catalogo generale delle opere esposte. Introduction by Andrea Emiliani. Bologna, 1987, repro. p. 56). 27. On the Florentine appearances, see A. G. Ferrers Howell. S. Bernardino of Siena. Essay by Julia Cartwright. London, 1913, pp.132, 135; and Karl Hefele. Der Hl. Bernardin von Siena und die franziskanische Wanderpredigt in Italien während der XV Jahrhunderts. Freiburg im Breisgau, Germany, 1912, esp. p. 97 n. 1. On the bonfires, see Vespasiano da Bisticci. Le vite. Edited with an introduction and commentary by Aulo Greco. vol. 1. Florence, 1970-76, p. 246. 28. F. Donati. "Notizie su S. Bernardino con un documento inedito." Bullettino senese di storia patria (Siena), vol. 1 (1894), esp. pp. 53-54. 29. There is some argument as to the date. Some authors prefer to place the event in 1426 (Dionisio Pacetti. "Cronologia bernardiniana." Studi francescani (Florence), vol. 40, 3rd ser., vol. 15, nos. 3-4 (July-December 1943), p. 167). 30. Ephrem Longpré. "S. Bernardin de Sienne et le nom de Jésus." Archivum franciscanum historicum (Florence), vol. 28 (1935), pp. 467-68, 472-73. 31. New York, The Metropolitan Museum of Art, no.13.175, 69 x 47" (175.2 x 119.4 cm); Federico Zeri with Elizabeth E. Gardner. Italian Paintings: A Catalogue of the Collection of The Metropolitan Museum of Art-Florentine School. New York, 1971, plates 24-25. 32. Decapitation of Saint John the Baptist, no. 41; 44 3/8" (including a 1 5/8" [4 cm] strip of replaced canvas) x 29 5/8" (112.5 x 75 cm): Luisa Becherucci and Giulia Brunetti, eds. Il Museo dell'Opera del Duomo a Firenze. vol. 2. Milan, n.d. [1969-70], plate 263. It is usually assumed that this painting was a processional banner. 33. Intercession of Christ and the Virgin (1402; canvas; 11 ¼ x 60 ¼" [239.4 x 153 cm]; New York, The Metropolitan Museum of Art, no. 53.37), by Lorenzo di Niccolò, was part of this complex on the west wall of the cathedral. See Federico Zeri with Elizabeth E. Gardner. Italian Paintings: A Catalogue of the Collection of The Metropolitan Museum of Art-Florentine School. New York, 1971, pp. 115-17 (with earlier bibliography), plate 33. 34. See n. 26 above for the canvas altarpiece by Giovanni da Modena. For another canvas banner of 1445, by Orazio di Jacopo, see Bologna, Pinacoteca Nazionale and Museo Civico Medievale. Il tramonto del medioevo a Bologna: il cantiere di San Petronio. Exhibition, October-December 1987. Catalogue edited by Rosalba D'Amico and Renzo Grandi, fig. 125. It is now in a private collection. 35. Shortly after the saint died, Sano di Pietro (q.v.) produced two detailed views of him preaching in the Campo and Piazza San Francesco in Siena (Keith Christiansen, Laurence B. Kanter, and Carl Brandon Strehlke. Painting in Renaissance Siena, 1420-1500. New York, 1988. Exhibition, New York, The Metropolitan Museum of Art, December 20, 1988-March 19, 1989, p. 41, figs. 5, 6), and the banner that Benedetto Bonfigli made in 1464 for a lay confraternity dedicated to the saint in Perugia showed Bernardino before an exact view of the confraternity's seat and the church of San Francesco al Prato (Perugia, Galleria Nazionale dell'Umbria, no. 164; Francesco Federico Mancini. Benedetto Bonfigli. Perugia, 1992, repro. p. 110).